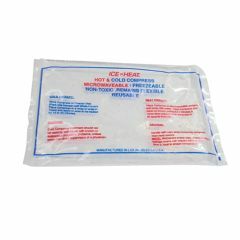 Ice N Heat Packs- 6" x 10"
Customers buy this product with the Regency Products Therma Kool (Ice N' Heat) Packs- 10" x 15"
Regency Products Therma Kool (Ice N' Heat) Packs- 6" x 10"
Regency Therma Kool (Ice N' Heat) Packs- 6" x 10"
The Regency Therma Kool (Ice N' Heat) Packs are the complete system for hot and cold therapy. Freezable and Microwavable for every situation. Doesn't hold cold well. Not Effective. Doesn't get cold enough. compared to the other flexible frozen gel packs, it does not get cold enough & loses its effectiveness too quickly. haven't used it as a heat pack & so cannot comment on that use. Stays cold. Flexible when cold. Comes in various sizes. Keeps lunches cold. For kids' boo boos. Following Surgery. I have been using this product for years, both personally, and professionally as an Occupational Therapist. It's extremely versatile: you can use it as either a hot or cold pack, and it remains flexible when cold, so you can shape it to cover wrists, knees, shoulders etc. It also keeps your lunch cold, but be careful--it can spring a leak if you fold it frequently to fit your lunch box!